In this project, developed in collaboration with MICC (Media Integration and Communication Center – University of Florence), watermarking techniques are used to synchronize events in a digital media stream. It’s tought for iTV or DVD. During the video, the extraction procedure reads the watermark opening web URL or messages like video or images, increasing the user’s information. and outputs an encoded audio/video stream in which said digital watermarking has been inserted. Any modification of the coefficients is carried exclusively on three consecutive “I” frames (Intra-frames). 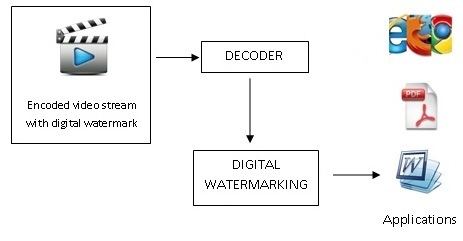 In the detenction step, a decode is used for extracting a digital watermark inserted in an encoded audio/video stream. Three consecutive “I” frames have been decoded, a “look-up table” lists all the actions to be carried out when a specific watermaking is found. When a valid watermark is found, from the “look-up table” is launched an application (e.g. Internet, Word or PDF type). In this project FFmpeg is used to run it. FFmpeg is a complete, cross-platform solution to record, convert and stream audio and video. It is a free software project that produces libraries and programs for handling multimedia data.